Children’s Day is always a happy event in Pattaya, as the children have a day off from their studies. One of this year’s celebrations was in Nongprue on Friday Jan. 10th and 3,000 plus children arrived to be entertained by a boy band, lady dancers, side shows and of course, Thai food – particularly noodles. 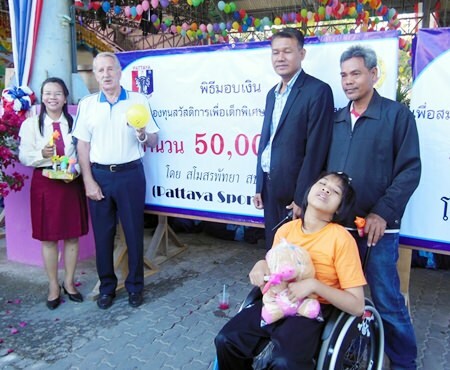 Nongprue Mayor Mai Chaiyanit opened the event and acknowledged the contributions of Nigel Oakes and Pattaya Sports Club, which was warmly applauded by those present. 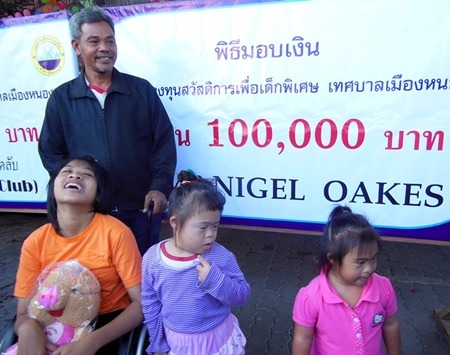 When Nigel Oakes, a friend of Pattaya Sports Club, visits these families, the concern on his face is obvious, for it says something must be done and a substantial donation is made by him. 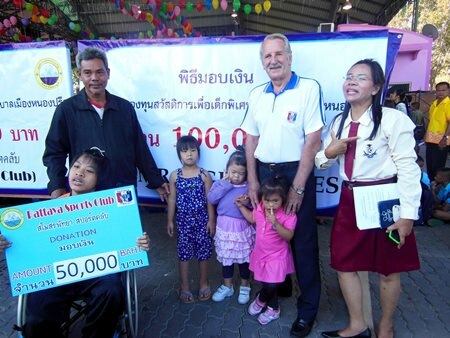 This, together with the contribution from Pattaya Sports Club, goes a long way to easing the problems for these families. Nongprue Mayor Mai Chaiyanit accepts our donations. 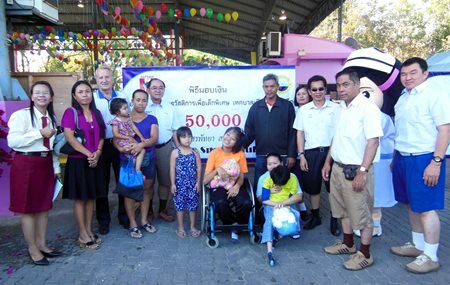 There are many severely handicapped people, both young and old, around Nongprue, unable to live a normal life and some are restricted to spending every day in their homes unable to leave their beds. Others need help to move around the area but most need 24/7 care and attention. One of the parents or family members must be in attendance at all times and are, therefore, unable to find any form of occupation to bring in those much needed baht. There are many essential items that are needed on a daily basis that eat into the limited finances that are available. Welfare Director Mow thanks PSC and Neil. Dang organizes events for 15 handicapped children. Poy, in the wheelchair, always seems happy. Some of the handicapped that will benefit.